The FCV1150 is a color Fish Finder designed for a variety of professional fishing operations. It features a high-brightness, bonded 12.1" LCD display with AR-coated glass filter and anti-polarized sunglass filter, providing superior viewing even in direct sunlight. You can choose to display the echo presentation in 8, 16, or 64 colors, with color assignment dependent on the strength of the returned echo. The Furuno Free Synthesizer (FFS) Transceiver allows for a wide selection of operating frequencies. You may choose any two frequencies between 28 and 200 kHz to best suit your fishing operation. Output power is selectable from 1, 2 or 3kW. A wide variety of display modes and functions are available that provide skippers with simple and intuitive information. The top of the seabed is displayed in white to easily discern seabed structure from bottom fish returns. While conventional bottom discrimination function called “White Line” applied to the strongest echoes, the White Edge function enhances the discrimination of bottom fish and seabed by painting a very thin line above the bottom contour regardless of gain setting or display color. With Furuno's post-processing gain control, changes you make to the Gain settings are applied not only to the new echoes, but also to all past echoes on the screen. You can compare past and current echoes using different Gain settings, allowing you to quickly and easily determine the right Gain setting for your conditions. No more waiting for the screen to repaint to see if your settings are the way you want them to look! When Furuno transducers are connected and set to the proper Fish Finder model, the operating frequency range will be registered and shown in the menu. You can shift the operating frequency freely between the ranges at any time from the menu. For example, with the Furuno CA82B-35R transducer, you can select any operating frequency from 66 to 109 kHz. This feature is particularly useful for vessels targeting many different species, or when the fish finders of other ships in the area cause interference. The rate of transmission is increased by more than 30% compared to conventional Fish Finders. As the result, more detailed information about underwater conditions can be gained through the same sounding interval. With the AUTO transmission function, the rate is automatically raised in shallow waters and lowered in deep waters, which provides for detailed detection of seabed targets. Even in rough sea conditions, this unit can compensate for heaving, presenting a display without undulations caused by the sea conditions. A Furuno Satellite Compass is required. 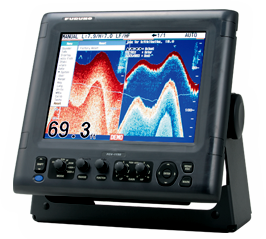 Through the Ethernet interface, the FCV1150 brings professional fish finding technologies onto your NavNet TZtouch or 3D network. Auto range, auto gain, shift and zoom controls can be performed from both the NavNet TZtouch/3D MFD and the FCV1150*. * Manual gain control and mode selection can only be done by the FCV-1150.